More than 11 million Mexicans live in the United States, including about 6 million who are in the country illegally. 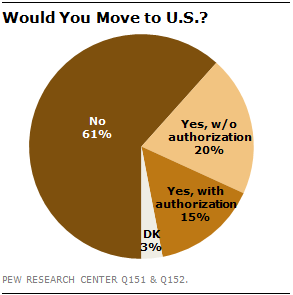 But their compatriots are less likely than they were a year ago to view the move north favorably. 47% of Mexicans say that people from their country who move to the United States have a better life there, down from 53% in 2012. About one-in-five (18%) say Mexicans have a worse life in the United States, up from last year; 29% say life in the United States for Mexicans is no better or worse than back home. But among Mexicans who have close friends or relatives living in the United States, 70% say those emigrants have achieved their goals, while just 25% believe they have been disappointed.